What can you do for love? The question really is, what won’t you do for love? Get ready to witness a different kind of love triangle between Eurydice, Orfeo and Eurydice’s father. We explore love, loss and the pleasures of pain and memory in this myth’s contemporary retelling that shows the young and very much in love Orpheus and Eurydice. “How can one possibly fall in love with another person? For us to fall in love, we have to find a way to give ourselves. 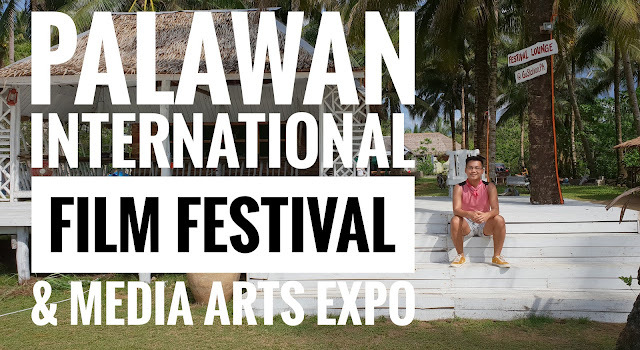 How much of one’s self can you give to falling in love?” Director Loy Arcenas throws us hard hitting questions that take us into an emotional rollercoaster dealing with love, love lost and grief. We are also presented with the complexity of being in a relationship and the differences two people in love have to deal with, such as having different expressions or languages of love. This depiction of Eurydice is arbitrary and unorthodox, and mirrors the realities of the human condition. Despite the sadness of the myth, a sense of wonder and hope envelopes deeper themes of death, love and loss. 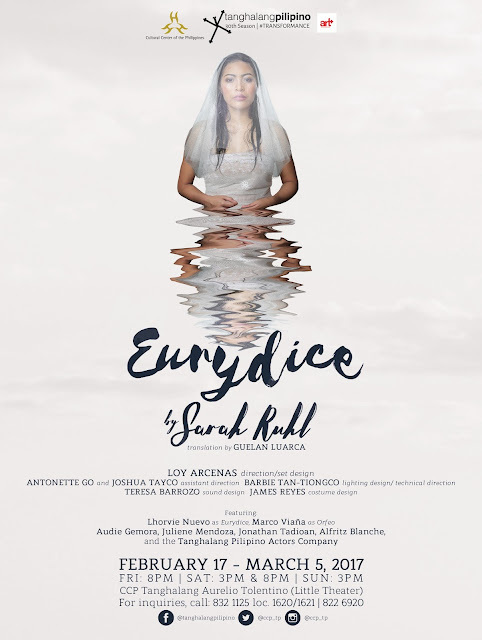 Tanghalang Pilipino’s Eurydice is not your typical love story. It is indeed a story about love – embracing not just romantic love but also the bond between a father and a daughter, family relationships, the complexity of marriage, and dealing with life & the afterlife. Be enthralled with a lot of imagery – water currents as an elevator in which it rains to get to the Underworld, rocks that taunt and whisper, flowers that adorn the wedding setting, and most of all, a thrust stage – one that extends into the audience on three sides and is connected to the backstage area – to provide greater intimacy between performers and the audience. 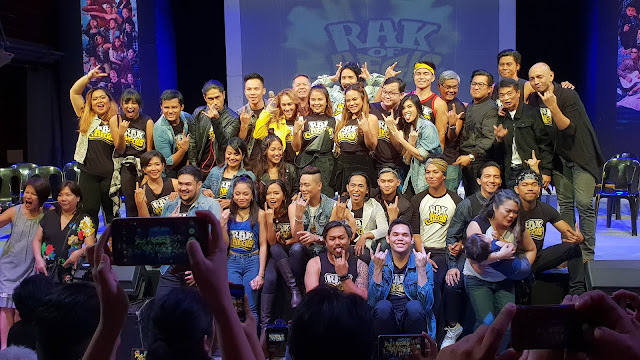 The cast features Tanghalang Pilipino Actors Company’s Lhorvie Nuevo for the title role and Marco Viaña as Orfeo, with guest actors Audie Gemora and Juliene Mendoza alternating as the Father, and Alfritz Blanche as the Big Stone. The production staff includes Loy Arcenas, direction and set design; Tanghalang Pilipino Actors Company’s Antonette Go and Joshua Tayco, assistant direction; Barbie Tan – Tiongco, lighting design and technical direction; Teresa Barrozo, sound design; and James Reyes, costume design. Tanghalang Pilipino is on its milestone 30th theater season, and as we close this season, we are proud to offer, EURYDICE, a Filipino adaptation by Guelan Luarca of Sarah Ruhl’s play of the same title, based on the Greek myth of the love between Orpheus and Euridice.